This article is about the seasonal winds. For other uses, see Monsoon (disambiguation). Monsoon (/mɒnˈsuːn/) is traditionally defined as a seasonal reversing wind accompanied by corresponding changes in precipitation, but is now used to describe seasonal changes in atmospheric circulation and precipitation associated with the asymmetric heating of land and sea. Usually, the term monsoon is used to refer to the rainy phase of a seasonally changing pattern, although technically there is also a dry phase. The term is sometimes incorrectly used for locally heavy but short-term rains, although these rains meet the dictionary definition of monsoon. The term was first used in English in British India and neighbouring countries to refer to the big seasonal winds blowing from the Bay of Bengal and Arabian Sea in the southwest bringing heavy rainfall to the area. The English monsoon came from Portuguese monção, ultimately from Arabic mawsim (موسم "season"), "perhaps partly via early modern Dutch monson." Strengthening of the Asian monsoon has been linked to the uplift of the Tibetan Plateau after the collision of the Indian sub-continent and Asia around 50 million years ago. Because of studies of records from the Arabian Sea and that of the wind-blown dust in the Loess Plateau of China, many geologists believe the monsoon first became strong around 8 million years ago. More recently, studies of plant fossils in China and new long-duration sediment records from the South China Sea led to a timing of the monsoon beginning 15–20 million years ago and linked to early Tibetan uplift. Testing of this hypothesis awaits deep ocean sampling by the Integrated Ocean Drilling Program. 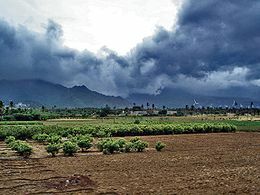 The monsoon has varied significantly in strength since this time, largely linked to global climate change, especially the cycle of the Pleistocene ice ages. A study of marine plankton suggested that the Indian Monsoon strengthened around 5 million years ago. Then, during ice periods, the sea level fell and the Indonesian Seaway closed. When this happened, cold waters in the Pacific were impeded from flowing into the Indian Ocean. It is believed that the resulting increase in sea surface temperatures in the Indian Ocean increased the intensity of monsoons. Five episodes during the Quaternary at 2.22 Ma (PL-1), 1.83 Ma (PL-2), 0.68 Ma (PL-3), 0.45 Ma (PL-4) and 0.04 Ma (PL-5) were identified which showed a weakening of Leeuwin Current (LC). The weakening of the LC would have an effect on the sea surface temperature (SST) field in the Indian Ocean, as the Indonesian through flow generally warms the Indian Ocean. Thus these five intervals could probably be those of considerable lowering of SST in the Indian Ocean and would have influenced Indian monsoon intensity. During the weak LC, there is the possibility of reduced intensity of the Indian winter monsoon and strong summer monsoon, because of change in the Indian Ocean dipole due to reduction in net heat input to the Indian Ocean through the Indonesian through flow. Thus a better understanding of the possible links between El Niño, Western Pacific Warm Pool, Indonesian Throughflow, wind pattern off western Australia, and ice volume expansion and contraction can be obtained by studying the behaviour of the LC during Quaternary at close stratigraphic intervals. This visualization shows the Asian monsoon and how it develops using observational and modeled data. It also shows some of the impacts. The impact of monsoon on the local weather is different from place to place. In some places there is just a likelihood of having a little more or less rain. In other places, quasi semi-deserts are turned into vivid green grasslands where all sorts of plants and crops can flourish. The Indian Monsoon turns large parts of India from a kind of semi-desert into green lands. See photos only taken 3 months apart in the Western Ghats. In places like this it is crucial for farmers to have the right timing for putting the seeds on the fields, as it is essential to use all the rain that is available for growing crops. Monsoons are large-scale sea breezes  which occur when the temperature on land is significantly warmer or cooler than the temperature of the ocean. These temperature imbalances happen because oceans and land absorb heat in different ways. Over oceans, the air temperature remains relatively stable for two reasons: water has a relatively high heat capacity (3.9 to 4.2 J g−1 K−1), and because both conduction and convection will equilibrate a hot or cold surface with deeper water (up to 50 metres). In contrast, dirt, sand, and rocks have lower heat capacities (0.19 to 0.35 J g−1 K−1), and they can only transmit heat into the earth by conduction and not by convection. Therefore, bodies of water stay at a more even temperature, while land temperature are more variable. During warmer months sunlight heats the surfaces of both land and oceans, but land temperatures rise more quickly. As the land's surface becomes warmer, the air above it expands and an area of low pressure develops. Meanwhile, the ocean remains at a lower temperature than the land, and the air above it retains a higher pressure. This difference in pressure causes sea breezes to blow from the ocean to the land, bringing moist air inland. This moist air rises to a higher altitude over land and then it flows back toward the ocean (thus completing the cycle). However, when the air rises, and while it is still over the land, the air cools. This decreases the air's ability to hold water, and this causes precipitation over the land. This is why summer monsoons cause so much rain over land. Most summer monsoons have a dominant westerly component and a strong tendency to ascend and produce copious amounts of rain (because of the condensation of water vapor in the rising air). The intensity and duration, however, are not uniform from year to year. Winter monsoons, by contrast, have a dominant easterly component and a strong tendency to diverge, subside and cause drought. Similar rainfall is caused when moist ocean air is lifted upwards by mountains, surface heating, convergence at the surface, divergence aloft, or from storm-produced outflows at the surface. However the lifting occurs, the air cools due to expansion in lower pressure, and this produces condensation. 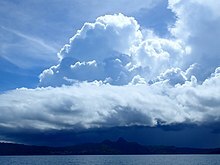 Southeast African moonsoon clouds, over Mayotte island. 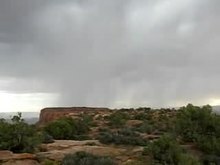 The southwestern summer monsoons occur from July through September. The Thar Desert and adjoining areas of the northern and central Indian subcontinent heat up considerably during the hot summers. This causes a low pressure area over the northern and central Indian subcontinent. To fill this void, the moisture-laden winds from the Indian Ocean rush into the subcontinent. These winds, rich in moisture, are drawn towards the Himalayas. The Himalayas act like a high wall, blocking the winds from passing into Central Asia, and forcing them to rise. As the clouds rise, their temperature drops, and precipitation occurs. Some areas of the subcontinent receive up to 10,000 mm (390 in) of rain annually. ^ Ramage, C. (1971). Monsoon Meteorology. International Geophysics Series. 15. San Diego, CA: Academic Press. ^ Trenberth, K. E.; Stepaniak, D. P.; Caron, J. M. (2000). "The Global Monsoon as Seen through the Divergent Atmospheric Circulation". Journal of Climate. 13 (22): 3969–3993. doi:10.1175/1520-0442(2000)013<3969:TGMAST>2.0.CO;2. ^ Zuidema, P.; Fairall, C.; Hartten, L. M.; Hare, J. E.; Wolfe, D. (2007). "On Air–Sea Interaction at the Mouth of the Gulf of California". Journal of Climate. 20 (9): 1649–1661. doi:10.1175/JCLI4089.1. ^ "Welcome to Monsoon Season – Why You Probably Are Using This Term Wrong". 29 June 2016. Archived from the original on 30 June 2016. ^ "Definition of Monsoon". 28 July 2016. Archived from the original on 19 July 2016. ^ a b Rohli, Robert V.; Vega, Anthony J. (2011). Climatology. Jones & Bartlett Learning. p. 187. ISBN 978-0763791018. Archived from the original on 2013-06-19. Retrieved 2011-07-23. ^ Glossary of Meteorology (June 2000). "Monsoon". American Meteorological Society. Archived from the original on 2008-03-22. Retrieved 2008-03-14. ^ "monsoon, n." OED Online. June 2018. Oxford University Press. Retrieved 1 August 2018. ^ ROYDEN, L.H., BURCHFIEL, B.C., VAN DER HILST, Rob, WHIPPLE, K.X., HODGES, K.V., KING, R.W., and CHEN, Zhiliang. UPLIFT AND EVOLUTION OF THE EASTERN TIBETAN PLATEAU. Archived 2008-05-03 at the Wayback Machine Retrieved on 2008-05-11. ^ P. D. Clift, M. K. Clark, and L. H. Royden. An Erosional Record of the Tibetan Plateau Uplift and Monsoon Strengthening in the Asian Marginal Seas. Archived 2008-05-27 at the Wayback Machine Retrieved on 2008-05-11. ^ Integrated Ocean Drilling Program. Earth, Oceans, and Life. Archived 2007-10-26 at the Wayback Machine Retrieved on 2008-05-11. ^ Gupta, A. K.; Thomas, E. (2003). "Initiation of Northern Hemisphere glaciation and strengthening of the northeast Indian monsoon: Ocean Drilling Program Site 758, eastern equatorial Indian Ocean". Geology. 31 (1): 47–50. doi:10.1130/0091-7613(2003)031<0047:IONHGA>2.0.CO;2. ^ Srinivasan, M. S.; Sinha, D. K. (2000). "Ocean circulation in the tropical Indo-Pacific during early Pliocene (5.6–4.2 Ma): Paleobiogeographic and isotopic evidence". Proceedings of the Indian Academy of Sciences - Earth and Planetary Sciences. 109 (3): 315–328. ISSN 0253-4126. ^ D. K. Sinha; A. K. Singh & M. Tiwari (2006-05-25). "Palaeoceanographic and palaeoclimatic history of ODP site 763A (Exmouth Plateau), South-east Indian Ocean: 2.2 Ma record of planktic foraminifera". Current Science. 90 (10). JSTOR 24091985. ^ "Sea breeze – definition of sea breeze by The Free Dictionary". TheFreeDictionary.com. ^ "Liquids and Fluids – Specific Heats". Archived from the original on 2007-08-09. ^ "Solids – Specific Heats". Archived from the original on 2012-09-22. ^ "Monsoon". Britannica. Archived from the original on 2007-10-13. Retrieved 2007-05-15. ^ Dr. Michael Pidwirny (2008). CHAPTER 8: Introduction to the Hydrosphere (e). Cloud Formation Processes. Archived 2008-12-20 at the Wayback Machine Physical Geography. Retrieved on 2009-01-01. ^ Bart van den Hurk and Eleanor Blyth (2008). Global maps of Local Land–Atmosphere coupling. Archived 2009-02-25 at the Wayback Machine KNMI. Retrieved on 2009-01-02. ^ Robert Penrose Pearce (2002). Meteorology at the Millennium. Archived 2016-04-27 at the Wayback Machine Academic Press, p. 66. ISBN 978-0-12-548035-2. Retrieved on 2009-01-02. ^ Glossary of Meteorology (June 2000). "Gust Front". American Meteorological Society. Archived from the original on 2011-05-05. Retrieved 2008-07-09. ^ a b "Southwest Monsoon 2017 Forecast: Warmer-Than-Average Conditions Could Lead to More Storms". Archived from the original on 2017-06-06. Retrieved 2017-06-06. ^ a b c d e f Silva, V. B. S.; Kousky, V. E. (2012). "The South American Monsoon System: Climatology and Variability" (PDF). In Wang, S.-Y; Gillies, R. R. Modern Climatology. Rijeka: Intech. pp. 123–152. doi:10.5772/38565. ISBN 978-953-51-0095-9. Archived from the original (PDF) on December 15, 2017. ^ a b c Innovations Report. Monsoon in West Africa: Classic continuity hides a dual-cycle rainfall regime. Archived 2011-09-19 at the Wayback Machine Retrieved on 2008-05-25. ^ a b c d e "West African monsoon". Archived from the original on 2016-06-25. Retrieved 2017-06-06. ^ a b c d e f g h i j k l m n o p q r "Indian monsoon | meteorology". Archived from the original on 2016-08-01. Retrieved 2017-06-06. ^ African Monsoon Multidisciplinary Analyses (AMMA). "Characteristics of the West African Monsoon". AMMA. Archived from the original on July 12, 2007. Retrieved 2009-10-15. ^ Arizona State University Department of Geography. Basics of Arizona Monsoon. Archived 2009-05-31 at the Wayback Machine Retrieved on 2008-02-29. ^ Explore, Team (2005). Weather and Climate: India in Focus. EdPower21 Education Solutions. p. 28. ^ Ahmad, Latief; Kanth, Raihana Habib; Parvaze, Sabah; Mahdi, Syed Sheraz (2017). Experimental Agrometeorology: A Practical Manual. Springer. p. 121. ISBN 978-3-319-69185-5. ^ "Why India's Twin Monsoons Are Critical To Its Well-Being | The Weather Channel". The Weather Channel. Retrieved 2018-09-05. ^ Official Web Site of District Sirsa, India. District Sirsa. Archived 2010-12-28 at the Wayback Machine Retrieved on 2008-12-27. ^ Blumer, Felix P. (1998). "Investigations of the precipitation conditions in the central part of the Tianshan mountains". In Kovar, Karel. Hydrology, water resources and ecology in headwaters. Volume 248 of IAHS publication (PDF). International Association of Hydrological Sciences. pp. 343–350. ISBN 978-1-901502-45-9. ^ "NORTHEAST MONSOON". Archived from the original on 2015-12-29. ^ Robert V. Rohli; Anthony J. Vega (2007). Climatology. Jones & Bartlett Publishers. p. 204. ISBN 978-0-7637-3828-0. Retrieved 2009-07-19. ^ Visser, S.W. (1953). Some remarks on the European monsoon. Birkhäuser: Basel. ^ Leo Hickman (2008-07-09). "The Question: What is the European monsoon?". The Guardian. Archived from the original on 2013-09-02. Retrieved 2009-06-09. ^ Paul Simons (2009-06-07). "'European Monsoon' to blame for cold and rainy start to June". The Times. Archived from the original on 2011-06-04. Retrieved 2009-06-09.
International Committee of the Third Workshop on Monsoons. The Global Monsoon System: Research and Forecast. Chang, C.P., Wang, Z., Hendon, H., 2006, The Asian Winter Monsoon. The Asian Monsoon, Wang, B. (ed. ), Praxis, Berlin, pp. 89–127. 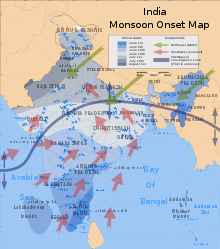 Wikimedia Commons has media related to Monsoon. Wikisource has the text of the 1911 Encyclopædia Britannica article Monsoon.